In conjunction with this transition the Google Maps Directory will be closed, and links to Mapplets will be removed from the My Maps tab in Google Maps. Bookmarks for existing Mapplets will continue to work. They will be automatically redirected to the new Mapplets page for the relevant Mapplet. The Mapplets page also has the minimum necessary UI elements so that it is better suited to embedding in third party sites using an iframe. However because the Mapplets page is not part of the Google Maps application, Mapplets will no longer have access to Google Maps user profiles, which means that User Preferences will no longer be stored between sessions. Users accessing Mapplets will now always see the default behaviour when the Mapplet first loads. The above changes will be made on or shortly after Wednesday December 8th 2010. If your web site recommends one or more Mapplets by linking to the Directory we recommend that you update your site to link directly to the Mapplets page, or embed the relevant Mapplets page in your site, as soon as possible. Thijs Damsma of Deltares discusses his use of KML to visualize coastal data. Ross Beyer of NASA and SETI discusses his work visualizing Mars data and imagery using Google Earth. OGC services and Google Earth. which received a very positive response. Building upon this, we’ve decided to make “Five Great Maps Examples” a monthly feature of the Geo Developers Blog. Each month we’ll pick five great maps using a certain technology, theme, or just a mix of five great maps that caught our attention. This month we will be focusing on Fusion Tables + Maps API implementations. 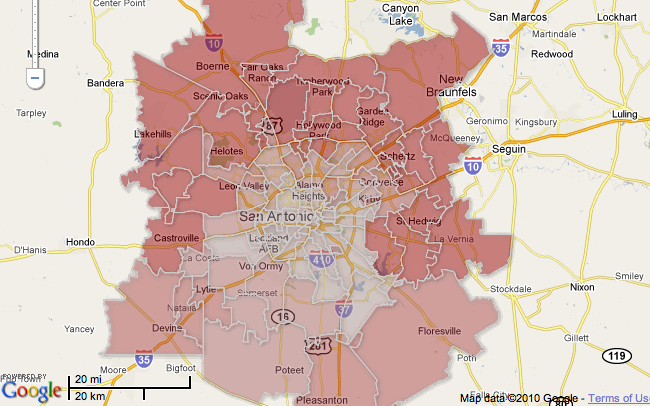 The most powerful maps allow users to quickly understand the significance of large amounts of data. Using Fusion Tables, polygons representing school districts and poverty levels are rendered and colored based on their assigned values in the tables. 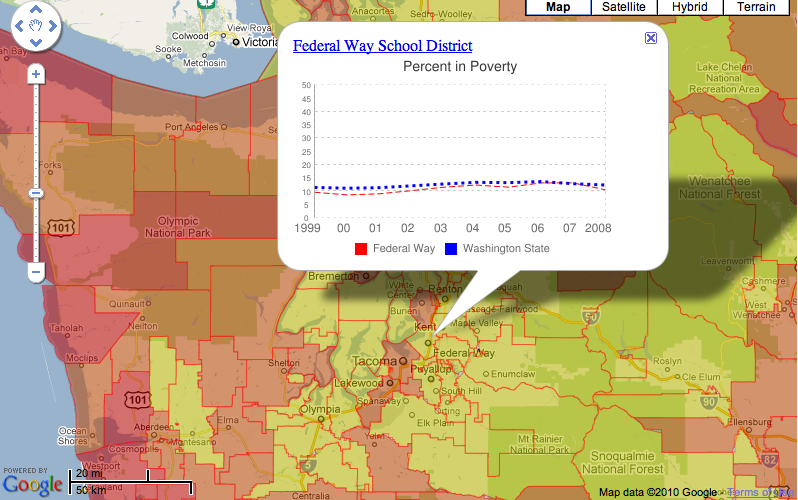 Clicking on a district polygon will bring up an infowindow containing a poverty line data chart, dynamically generated through the Google Chart API. Fusion Tables makes crowdsourcing easy. 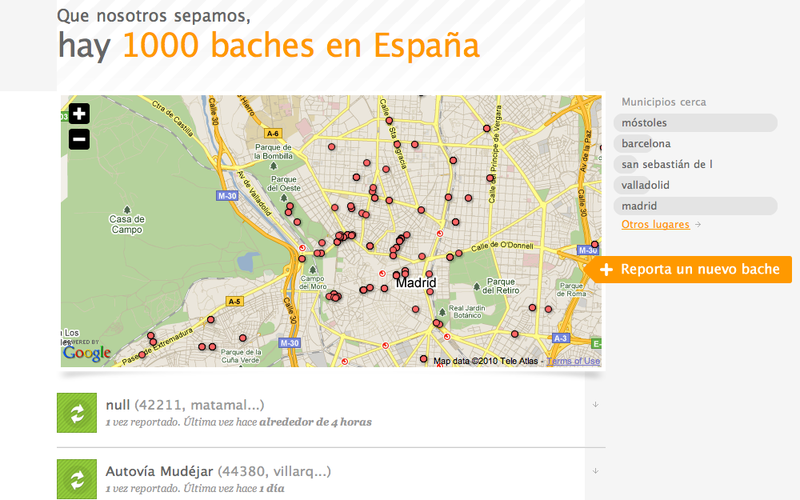 Using Fusion Tables, Otrobache.com allows Madrid citizens to log on and report the location of potholes. The newly reported potholes appear on the map in real time (as soon as the map is refreshed). Fusion Tables is a great way to store and quickly render large amounts of data. The Telegraph used Fusion Tables to catalog and map literally tens of thousands of charities throughout the UK. From San Antonio Express-News, "The Texas Tribune analyzed a Department of Public Safety database that tracks concealed handgun licenses in Texas. The Tribune's analysis found that the number of gun permits in an area often correlates with income and political beliefs." Fusion Tables is used here to overlay the data with boundaries and view possible correlations. The implementation also makes use of Gradient styling. Gradients allows developers to specify a color ramp and a number range; features will be displayed in the color appropriate for where they belong in the range. Much like the built-in Intensity map visualization, but now you can change the colors and use your own boundaries! Using geometry styling controls in Fusion tables, this implementation is a live visualization of London Cycle Hire Rank availability using data from the Boris Bikes API. Editors Note: Early last October we blogged about Five Great Styled Maps Examples, which received a very positive response. Building upon this, we’ve decided to make “Five Great Maps Examples” a monthly feature of the Geo Developers Blog. Each month we’ll pick five great maps using a certain technology, theme, or just a mix of five great maps that caught our attention. This month we will be focusing on Fusion Tables + Maps API implementations. Search your geo data using spatial queries from Fusion Tables! , and I have to say, I really dig Fusion Tables. The power it gives you to visualize your data is amazing! Plus, the team is working hard to add new features that give even more power to you, the developer. It is my pleasure to announce that Fusion Tables now offers spatial queries! Using spatial queries, developers can (1) find all features that are located within (or overlap with) a given distance from a location (2) find all features that are located within (or overlap with) a given bounding box, and (3) find a given number of features closest to a location. To demonstrate some of the new syntax, let’s go through a potential use case of spatial queries: creating a store locator map. For this demo, I set up a table in Fusion Tables, 297050, containing the locations of a fictitious pizza restaurant chain in the San Francisco bay area. The table contains the name, location, and whether or not that location delivers. The map to the left shows this query in action using the FusionTablesLayer. The example shows all rows in the pizza table that fall within the bounding box specified with a lower-left coordinate of 37.2, -122.3 and a upper-right coordinate of 37.6, -121.9. These 2 examples demonstrate how to create a store locator-like map, but the possibilities are endless! You could create an application that finds the most popular bike trail routes in your area or enable crowd sourcing to identify roads that might need more street lamps. To learn more about the full spatial query offering in Fusion Tables, please see the Fusion Tables documentation. You can also join the Fusion Tables User Group to receive announcements about new features or post questions you might have about Fusion Tables. Or follow us on Twitter: @GoogleFT. And, most importantly, have fun creating awesome apps! I’m Kathryn Hurley, a Developer Programs Engineer for Fusion Tables, and I have to say, I really dig Fusion Tables. The power it gives you to visualize your data is amazing! Plus, the team is working hard to add new features that give even more power to you, the developer. Today we’re adding Australia, Austria, Belgium, Denmark, Liechtenstein, Netherlands, New Zealand, Norway, South Africa, and Switzerland to the set of countries in which this is possible. These map updates will improve our geocoding and directions, increase the accuracy and coverage of natural features such as forest and water bodies, and add walking paths and bicycling trails. The updates will roll out over the next 24 hours, and will be applied automatically to existing Maps API applications. However we ask that you refresh any cached addresses, latlngs, or routes for these countries that were obtained using the Maps APIs before this update as soon as possible. If you have any questions or concerns about how these updates affect your Maps API application, or for help refreshing your cached data, please post to the relevant forum. We look forward to lots of great map feedback from our users in these countries that will improve the maps experience both in Google Maps and in the Maps API. We’re always looking to improve the accuracy of our maps and the value of the services we offer around them. To do that we need to have the best quality map data possible, and we believe that nobody knows the world around them better than our users. For this reason we’re always excited when we can update our maps and enable users to participate in improving them, as we have previously in the United States and Canada. Google Developer Days and DevFests are a chance to learn about Google’s developer products and meet the engineers who work on them. With GDD Brazil finished, I attended DevFest Argentina to give presentations on the Maps APIs, Earth API, KML and Fusion Tables. Following that we’ll have events in Munich, Moscow and Prague. Hope to see you on the (now more styled) road. When the Maps Data API was launched in Google Code Labs last year, it provided developers with a scalable distributed platform for hosting geospatial data. Since then we have received a lot of valuable feedback from developers, such as the need for visualisation of hosted data in Maps API applications, easy migration of existing spatial databases into the cloud, and a familiar data model and query syntax. Earlier this year we launched a feature in the Google Maps API v3 that renders data stored in Fusion Tables, a Google Research project for storing large structured data sets in the cloud, which has an SQL based API, and recently gained support for spatial queries. The response both at developer events and online has been overwhelmingly positive. 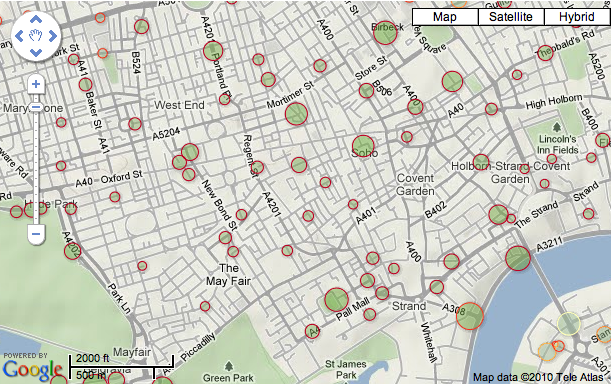 We have seen an explosion of compelling Maps applications that use Fusion Tables to store and visualise data. Given this developer enthusiasm, and the fact that Fusion Tables addresses many of the features requested by developers for the Maps Data API, we have decided to recommend Fusion Tables as our cloud storage solution of choice for geospatial data going forward, and to deprecate the Maps Data API. The Maps Data API will continue to be accessible until January 31st 2011, and Maps created using the Maps Data API will remain accessible in Google My Maps beyond this date. During the deprecation period we are also providing a Maps Data API data liberation tool. This tool offers download of Maps from the Maps Data API in KML format, or transfer to Fusion Tables, by the user that owns the data. Both data transfer and download to KML will preserve all data for the vast majority of maps. There are some rarely used features (e.g. certain custom properties) that are not represented in the KML download. See the FAQ in the tool for more details. If you have any questions or concerns about the deprecation of the Maps Data API please consult the Maps Data API Forum. If you have been working with the Maps Data API we understand that this announcement may be disappointing. However we encourage you to take a look at Fusion Tables. We’re excited by the possibilities offered by its ease of use and powerful search and visualisation features, and we think you will be too.